Pardon me while I take a moment away from the holiday cakes, cookies and cocktails to discuss a vegetable that hasn't been candied and topped with marshmallows. No worries, though, because there are plenty more caloric goodies coming your way before we all wake up on New Year's Day and realize there are only 6 short months till bathing suit season. We're actually big veggie eaters in our house, whether there's cake for dessert or not, and cauliflower probably makes the most frequent appearance. We almost always oven roast it then serve it up with some Parmesan cheese but I was looking for a way to make it into a great salad. I've used it raw that way before but roasting just brings out so much more flavor so we always revert to it. But, why can't the salad be roasted? Cooled and dressed in a tangy lemon vinaigrette it takes salad to a whole new flavor level. So now, hot or cold, we're still going to be buying cauliflower by the truckload. Enjoy! 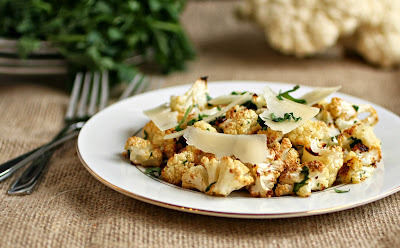 Place the cauliflower florets on a baking sheet lined with parchment paper. Bake in a 400 degree oven for approximately 45 minutes or until the cauliflower is a light golden brown. Make the dressing by combining the olive oil, lemon juice, mayonnaise, mustard, parsley and garlic. Whisk well, add the roasted cauliflower, season and top with some shards of Parmesan cheese, if desired. Makes 2 servings. 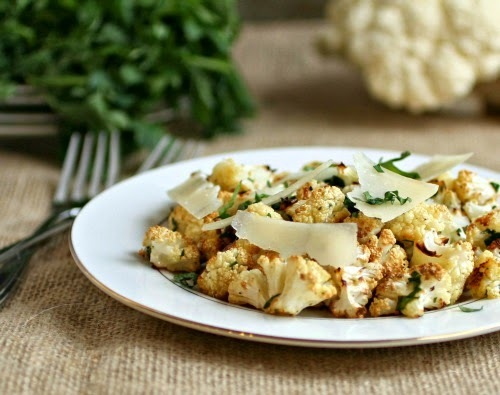 Yes to cauliflower season! Roasted is the only acceptable way to enjoy it. Next time I'll have to add some parm on top. Yes!! 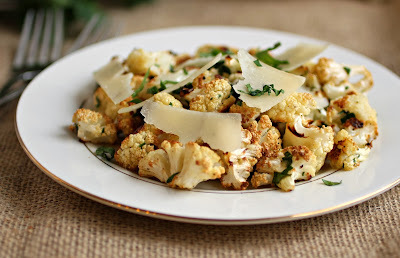 I love cauliflower and eat it almost any way it's prepared. This really looks wonderful! Pinning right now to make this week! as a light dinner tonight for my hubby and I. I can't wait to try it. Thanks!! !